This is the third painting for my systematic theology paper. The third Person of the Trinity, the Spirit, was painted on the smallest envelope. I made the Spirit the smallest because He’s always in the background, it seems, in scripture and we know the least about the Spirit. I am placing the Spirit envelope inside the Son envelope (and the Son envelope inside the Father envelope) to symbolize how the Spirit submits to the Son and to the Father. Instead of placing Scriptures about the Spirit on the background, as I did in the other two paintings, I decided to cut my pictures out of the Scripture that they symbolize to tie the different symbols of the Spirit together. 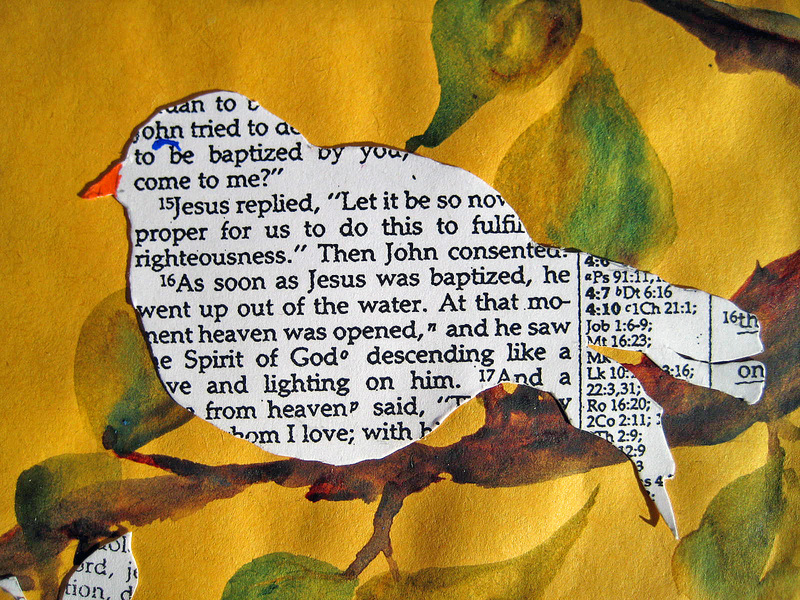 The symbols I decided to use (I was limited because of space since this was the smallest envelope) are the dove (Luke 3:21-22 when the Spirit descended on Jesus like a dove), fruit (Galatians 5:22-23 for the fruit of the Spirit), and gifts (I Cor. 12:1-11 that lists the spiritual gifts of the Spirit). I photocopied these scriptures out of my bible, and for example, you can see that the gifts are made out of the paper that has the scripture from I Cor. 12:1-11 on it. 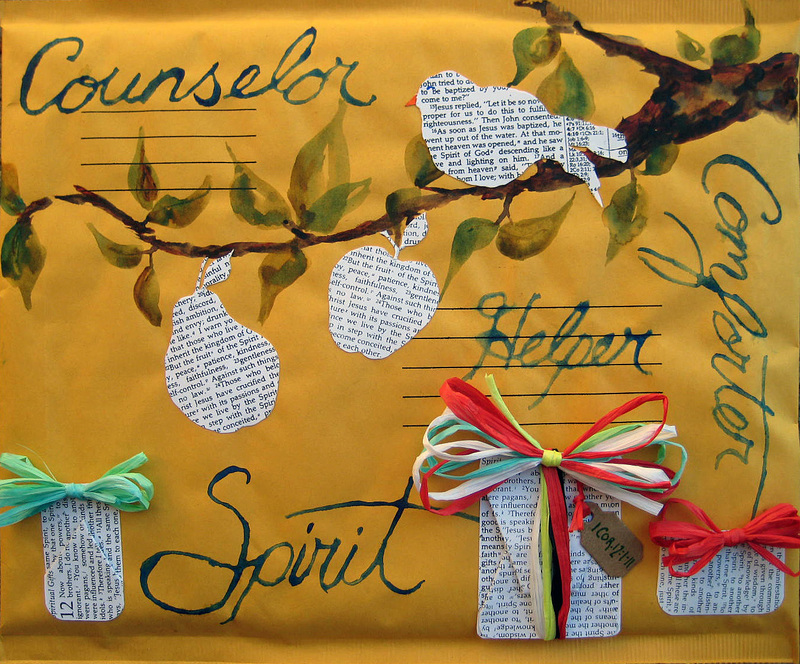 The names of the Spirit I used are Counselor, Spirit, Helper, and Comforter. On the back I put two hymns – one to represent the Trinity and one that represents the Spirit. 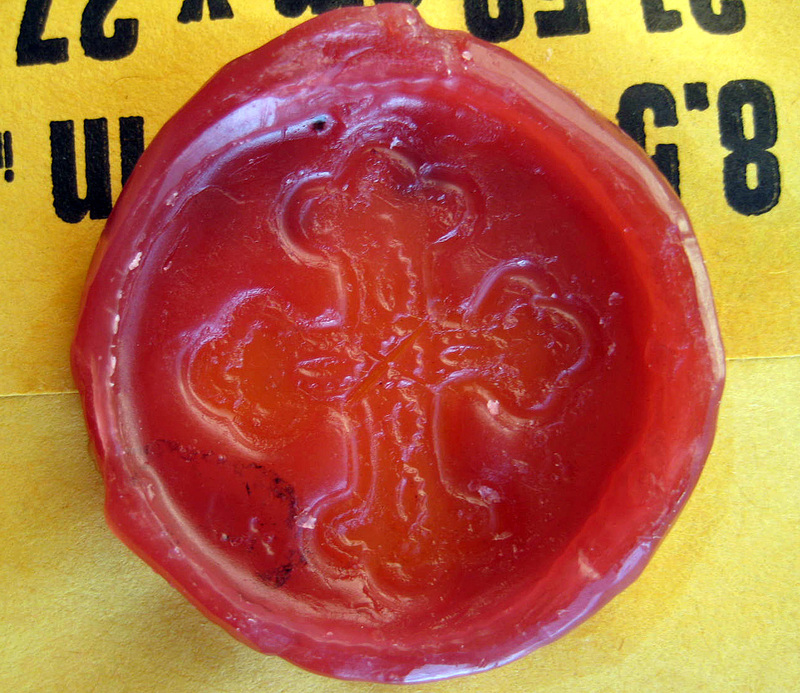 I also made a seal out of wax for this envelope because Scripture tells us that those who believe are marked with a seal that is the Holy Spirit. I made two different seals and couldn’t decide which one to use so I just put both of them on there – I worked forever on those things :). 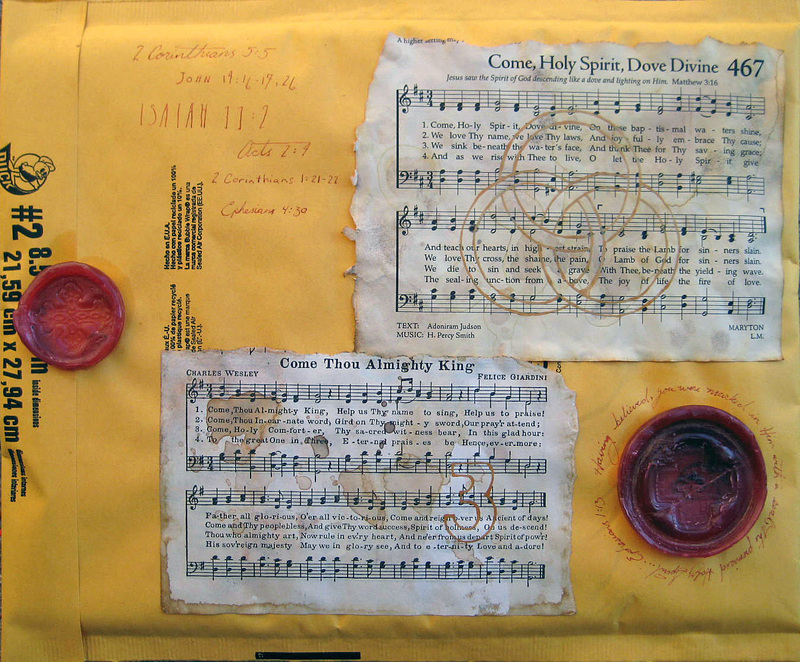 I also completely sealed this envelope – it cannot be opened – to further symbolize the sealing of the Spirit. I placed some important scriptures on the back about the Spirit: 2 Cor. 5:5; John 14:16-17, 26; Isaiah 11:2; Acts 2:4; 2 Cor. 1:21-22; Eph. 4:30. Well that’s my project! It took MUCH longer than I thought it would – but it was a lot of fun. I hope you enjoyed it too! Susan, you’re cracking me up! Hope to see you Saturday at the art sale! Sandi, Can you imagine the fun I am having each time you post a new work??? I am so glad you are using your gift to glorify the Father. You have come along way since the Black Sea. I love what you did for your class. It is beautiful!! I am so glad our paths crossed. I see the painting you did for me each time I walk into my bedroom. I will treasure it always and you my special friend. Blessings on you!! Oh Sherree, what a blessing to check my comments and see one by you dear friend! For anyone reading this comment this is the lady who sat me down one night and gave me ‘what for’ (that’s southern for – gave it to me) and told me I needed to stop hiding my gift of painting, but use it for the Lord. I came back from the Black Sea and started this blog and not long after that had my first art sale. Sherree, I’m having my 3rd art sale of the year this weekend. The Lord has brought me a long way since that trip. I am so thankful for your frankness and if I remember correctly finger in my face :). I am beyond glad our paths crossed! I think of you guys often and miss you so much! Please tell Carl I said hi! I hope I get to come see you guys next year. Thank you for your sweet comment! You guys doing ok? I could have kicked myself on the last trip because I meant to tell Julie to let you and Carl go through the paintings I sent over and let yall pick one for yourselves – urgghh – I hate I forgot to tell her that – she said she had the same thought but since I didn’t tell her that she didn’t offer it. Just know next time one will be sent your way! Love you guys! Sandi this is AWESOME!!! I agree A+++!!! Love it and love you girl! Thank you Christy! I can’t believe the response I’ve been getting from this paper/project. Love and miss you friend! Sandy, I alway look at your post, but have never commented, but this is truly awesome!!!! What a tremendous work of art! God has truly blessed you, not only with your artist ability, but with the understanding and delivery of the Trinity!!! You are one outstanding woman of God, and I am so very proud of you! Keep up the work!!! God is using you in a mighty way! Thank you Mrs. LeMarbre! Thanks for taking the time to leave me such a sweet comment. I hate yall were out of town for the sale. We haven’t seen yall at Chick-fil-A in a while :). I love your work, Sandi. It is all so very beautiful. So nice to sit and chat with you today. It was a pleasure meeting you. I hope to see you again soon in the near future. By the way, that was a bookmark I gave you today 🙂 I don’t know if you could tell or not. Brittney!!! I was so excited to see you’d left me a comment. I REALLY enjoyed meeting you yesterday – I’m so glad we had a chance to talk and I’m hoping we have more opportunities in the future! I quickly checked out your blog – very nice – and I’ll be checking it regularly. Yes, I knew that was a bookmark – it is beautiful – thank you for that – I’ll be putting it in my bible. Feel free to e-mail me Brittney (sandigrady@comcast.net).